Free Hand Embroidery Pattern: Sprouting Floral – and Your Input? This is the final of three hand embroidery patterns that have been occupying my imagination lately. The first of the three was this Exuberant Flower design, and then this Openwork Flower Design, and then there’s today’s, which for some reason, I call Sprouting Floral. The name lacks something. Or maybe it says too much? In any case, it’s not a very attractive name. Dubbing things with a name is not my forté – if you want to make suggestions, feel free! In any case, now and then, I start thinking ahead to The Next Project. Actually, I’m always thinking ahead to The Next Project. Sometimes, I’m thinking ahead to The Next Project with such ferocity that the current project stalls a bit. One of the curses of being sanguine, I suppose? For my next project, I want to put together a small goldwork / real metal thread piece suitable for beginners – something that covers beginner techniques in goldwork, that is small enough to be manageable, but intricate enough to be interesting. The three patterns I’ve posted recently are possibilities – they’re all in the running. I’m not sure which one to settle on, though. If you want to help me along with the decision-making process, you are more than welcome to proffer an opinion between the three recent patterns – today’s, last week’s openwork flower, and the previous week’s exuberant flower. According to my “schedule” (and I mean that word in the broadest, loosest context! ), I’m due to start this project around December. All that said, this pattern today – Sprouting Floral (Flouting Sporal?) – is suitable for other embroidery techniques, too, from regular surface embroidery to appliqué. There are plenty of larger, open elements there that would work for appliqué. Here’s a convenient PDF for printing. The design prints around 3.5″ high, but you can enlarge or reduce it in your printer settings or on a photocopier. Some fun stuff coming up on Needle ‘n Thread, including an embroidery class membership give-away for an online needlepainting class for beginners, including all the needful stuff that goes along with the class. Next week, we’ll get back to some Stitch Fun, exploring more ways to embroider leaves. I’ll also give you a project update, and we’ll also look at an embroidery tool that baffled me for a bit and pays homage to the needleworker’s propensity for accessorizing! Did you notice I was out of town last week and the beginning of this? There was a wedding in the family – ’twas a glorious time and a good break! If you emailed last week or early this week and didn’t receive a reply, it’s because email was not always accessible. Feel free to nudge me with a reminder. I’ll be using this weekend to catch up. If you have any input on these embroidery pattern – a preference for one over the other – or a better name suggestion for today’s pattern – do feel free to have your say below. I vote for Exuberant Flower. It’s a nicely balanced flower without being symetrical. I can see driving myself into perfectionism trying to get the 2 halves of today’s flower the same, instead of concentrating on learning the goldwork. I was so glad to read this post Mary! I’ve been shopping around for a goldwork kit for beginners as it’s a technique I’d like to try but haven’t had any luck, so good timing! I personally like the cutowork flower best, but I have no idea which is best suited to goldwork. I’m not very good at names, I came up with flowering… something for this pattern but obviously got stuck! All these flowers, what fun :). Today’s reminds me of an exagerrated Fleur de Lis, sometimes also called a Lily. So maybe Baroque Lily? And a beginning goldwork project would be greating appreciated. Perhaps the first of the flowers? It has well-defined areas for fill work and strong boarders. Thanks! I have been following your ‘mission rose’ series and wonder if you would summarize the goldwork threads you have used. You nicely summarized the silks, but you made several substitutes with the gold threads and did not always indicate the replacement sizes. Doing this in your next, but last? update would be appreciated. So excited to hear you plan on presenting a small goldwork project. I have been wanting to use my gold threads and was unsure where to start. I will be waiting in anticipation; it will be a great little fall project. 🙂 Bountiful Blossom is a great name! Thank you so much for your interesting articles and the time you put in. My favourite is the Exuberant Flower. Could we also have some more information on Needle Painting, please? I love everything about it but have still not quite dared pick up a needle. I am thinking of getting a beginner’s kit for Christmas but then goldwork also interests me. Please keep up the fabulous work! For beginning goldwork, I’d prefer the Exuberant Flower, but I think that the leaves need to be moved away from the flower. Otherwise, any outline of the leaves and the flower, whether in gold or any other fiber, will be difficult to do, let alone see and appreciate. I like todya’s Sputing Flower for goldwork. If yu use the openwork one, then please make it the repaeting cirle. I vote for today’s as a first choice and the exuberant flower as a second choice for the goldwork project. Please us Sprouting Floral for the goldwork pattern. I really love this one but I would rename it Waterlily! Thanks for the chance to express my opinion, love your blog! Today’s pattern is my choice…and I also like the suggestion ‘Bountiful Blossom’. A wedding, how delightful. Pleased it was a lovely time. And a stitching class giveaway…goody! Hi Mary, I love these flower designs and, in keeping with the names of the other two, I suggest Flourishing Flower. Thank you for all of the free designs you provide, I look forward to reading your posts every day. I like the Openwork Flower the best. I’m glad to read you are planning a beginners Goldwork project. I have been hoping to learn about using different Goldwork threads and techniques after watching you work through your beautiful projects but did not know how to begin on my own. i would really love to see you work up the exuberant flower, please! I think “Sprouting Floral” is just the perfect name for this design. They are all pretty, but I like Sprouting Flower the best. As for the name, and if you are thinking of an alternative, how about crown flower or “crown” something? The leaves radiating out from the center remind me of a crown. And thanks for the free pattern! I think all of these would be pretty done in shadow embroidery too. The Sprouting Floral pattern is lovely but I think I prefer the Openwork flower with the option of the single or repeat design. I look forward to the goldwork project for beginners and I’m looking forward to more on embroidering leaves and the embroidering tool sounds intriguing can’t wait to find out all about it. I hope you had a great time away with your family, I’ve just returned from touring South Wales which was wonderful, but can’t wait to get back to stitching. Thanks for the pattern. Ooh, I do hope I will be able to do this goldwork kit. I am going to a beginners goldwork class at the Royal School of Needlework in the UK next week. A kit like this would be a perfect follow up. I like the openwork design best. And this ‘sprouting’ one next. Has anyone sent you pictures of what they’ve done with these designs? I’m curious to see hop people interpret them. There are so many techniques and ways to work. Like Picasso, one could have an Exuberant Flower phase. Makes me giddy to think of it! How about calling today’s design “bursting buds”. Kidding aside, I am wondering if “openwork floral” in your expanded design would be too detailed for a beginning goldwork project. I absolutely love the little unpretentious flower drafted into the pinwheel design. Hi Mary! Love today’s design the best by far. The openwork design is just a little too asymmetrical for me unless it were in the pinwheel and then it would be too large a project, perhaps, for a beginner. The second design is a bit overwhelmed by the leaves, otherwise it’s not bad, but this design, which I like to say is a Crown of Flowers, as Linda S. suggested, is a good name but yours is good as well. Thanks for the designs and the opportunity to have input. You’re a peach! Today’s pattern *almost* looks like a passion flower design which I am sure you have seen many times in ecclesiastical embroidery work! 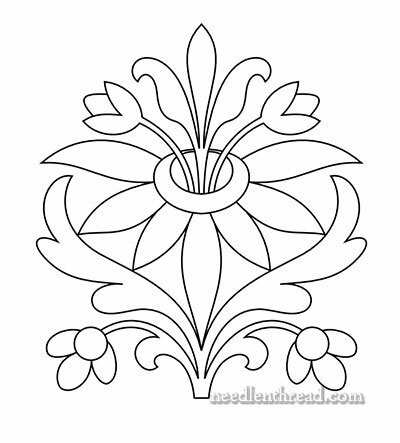 I would love to see this flower design developed into a goldwork project; it really caught my eye, more so than the previous two, and just said to me, “Do me in gold work!” Maybe the flower petals could be done in purple silk shades. Thanks for sharing this with us! I would like today’s flower in goldwork. It has so many different elements that could be used for different techniques. I have never tried goldwork. I envy the lady who is going to UK for classes. I don’t even have any local learning opportunities. Your website is a great resource. My favorite is definitely the Openwork Flower, both single and expanded versions. I’m not ready to try goldwork (yet), but I’m intrigued by the possibilities of the openwork design. Hmmm. Fabric, colors, stitches? I know I’ll have fun playing around with it! I vote for the openwork flower. It’s one I wanted to stitch from the first time I saw it. It has a nice inside and an outside rim, which gives a lot of options. I thing today’s flower could be called “a flower within a flower.” At least, that’s what it looks like to me. How about Royal Blossom. It has the look of dignity about it. Reminds me of a passion flower. How about floral fountain. It seems there are many more where that one came from! Very Pretty. 🙂 “The Sprouter” is definitely my kind of name for a design. Simple, and to the point! For me, this was not a tough decision. For the beginners goldwork project, I like the third design, what you have called the sproutng flower. I also think a good name for that flower would be Victory Flower. Here in South Africa many of us have passion fruit growing in our gardens. There is a similarity in the flowers. Therefor I suggest your beautiful design is called Flower Passion. Thank you for the brilliant blog. I think I am addicted to it. I have been silently watching your embroidery projects and loving them. I did a lot of crewel work when I was younger but you have opened my eyes to so many stitches, techniques and just cool stuff! You asked for suggestions for the ‘beginners’ project and I would LOVE to see the small, pretty Exuberant Flower pattern used. Its small enough as to not be intimidating and seems more like a complete design than, for example, todays Sprouting Flowers. I’m sure you have many wonderful ideas for palettes and stitches! I vote for the openwork flower – because it’s not too symmetrical with it’s too different leaves, and it’s got lots of long lines that will be good for various couching techniques and, I would have thought, easier for beginners to goldwork. I think the exuberant flower has most of the votes so far though! 🙂 I will be very interested to see which one you decide on! this is a nice design which is made more beautiful by tambour work. the colour combination is pleasant. if it is taken as a block and repeated as a border ,moreover if small blocks of inside the cloth it will look more beautiful. From Brasil, i´m just enjoying this creatives possibilites. Muchas gracias por tu conocimiento sobre bordado, he disfrutado viendo tus videos y tus diseños completos; felicitaciones, eres una artista. Next Next post: Blue Ribbon Embroidery! Recognize It?